When the eight Indigenous artists chosen for the Musee du quai Branly commission were announced in 2005, John Mawurndjul from Maningrida made a dynamic speech entirely in his Kuninjku language, and everyone there at the Art Gallery of NSW felt quite sure they'd understood the lot. The artist's confidence in the rightness of his selection and his own cultural authority was boundless. Later, he'd insist on going to Paris to supervise the installation of his vastly expanded artworks in the new building. Then John Mawurndjul's circumstances changed, brought about by a combination of the GFC, the Intervention and his art centre going into administration. He lost the three trucks he had owned (used to service the Milmilngkan out-station), and was forced to move into a town camp just outside the Maningrida township. He stopped painting, applied for a job as a tyre repairer and was given a 'Basics Card' (a type of card used to restrict spending to "...food, clothes, health items and hygiene products at a variety of approved stores and businesses"). The next four-years was a hiatus period. And John Mawurndjul, who had been awarded an AM for being, “..the foremost exponent of the Rarrk visual art style”, received no encouragement from the southern art establishment, with no offers of an exhibition in any major institution at all. It took freelance curator, Hetti Perkins, and private museum, TarraWarra (TWMA) in the Yarra Valley, “to bring John back into the limelight”, as Perkins put it. And as 'Earth & Sky' opened, John Mawurndjul also had a commercial show at Annandale Galleries and his works were included in the Museum of Contemporary Art's 'Light Show'. Mawurndjul, a spiritual leader, paints the Mardayin ceremony, which academic, Luke Taylor, describes in the TarraWarra catalogue as a, “highly abstract conceptualisation” of the complex relationship between the Djang - or Ancestral Beings which created the Country and then disappeared into it, leaving behind an energy which is reflected in ceremonial body designs - and uniquely translated into electric striations by Mawurndjul in his art. 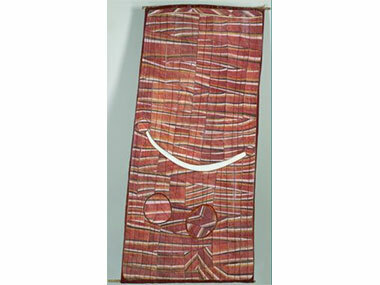 Arguably, the wall of his magnificent recent barks at TarraWarra would have been even more effective if contrasted by some of his earlier works, many of which were shown by Perkins in the important 2004 Kuninjku exhibition in Sydney, 'Crossing Country' which portrayed those Beings imaginatively on bark, as that would have underscored John Mawurndjul's development since being recognised with the 2003 Clemenger Contemporary Art Prize. But Mawurndjul had rejected that idea, telling Hetti Perkins that that was, “Just high school stuff”. 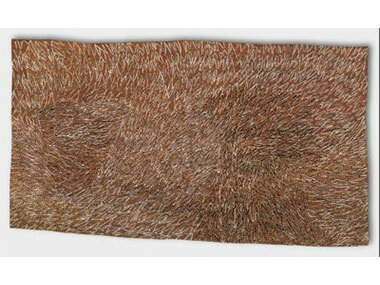 In 'Earth & Sky' Hetti Perkins also gives equal limelight to Yolngu artist, Gulumbu Yunupingu, who, like Wawurndjul, rejected canvas for (stringy) bark on which to create utterly contemporary images. Gulumbu Yunupingu (who died in 2012), had a life before art as a healer, teacher, Bible translator and mother, only starting to paint around 2000. And, while there was an extraordinary consistency of subject-matter through her brief career –Ga rak/The Universe and Gan'yu/Stars – the TWMA show reveals just how much variety she could get into her supernal imagery. “She had such a mastery of colour”, explained Perkins. “I had no idea she could conjure plum and olive out of her ochres. She seems to take an elemental array of imagery – just dots and lines - and blow it up on a symphonic scale. There are no short cuts”. Like the desert artists who seem to be able to rise above the Earth to imagine an aerial view of their Country, so Yunupingu would lie on her back and "Hubble" herself into far space to see the heavens as they really are. Her Buku Larrnggay art co-ordinator, Will Stubbs offers these images as proof of Gulumbu's perceptiveness which were taken by Hubble as it zoomed into the distance, producing images which increasingly resemble Yunupingu's barks. Stubbs also points out that there are politics and philosophy, as well as cosmology, in her work. She discovered a relationship with the stars as a girl when she was lying asleep under them with her family, only to be wakened by rain seemingly falling from a cloudless sky. “Maybe it's the stars crying”, suggested her mother. As a result, Gulumbu's stars must have an eye. “The stars are us; everyone in the world”, is what Yunupingu told audiences as she too had an artwork incorporated into the Musee du quai Branly in Paris; “and with an eye at each star's centre, tears fall in compassion, grief or joy for our foibles”. “They are love incarnate”, assesses Stubbs. “She could see beyond the stars, past the past, the crimes, the colour, and the pain of that incomprehensible alien landing (by missionaries) in 1935 to embrace the world in ways consistent with the principles of the world's oldest ongoing civilisation”. Earth & Sky ends on Monday 8th June 2015.